The core facilities at Lake Point Church had been in place for more than 20 years with minimal updates. The vision for this 138,000 SF renovation to the main campus was to provide a greater feeling of warmth and community while also providing additional space resources through the capture of under-utilized space within the existing building volume. The renovated spaces contribute to a welcoming sense of connection among church members and guests as well as more potential for casual interaction. The updated areas include a fellowship room with fireplace, soft seating groupings, coffee shop and a bookstore that provide overflow worship spaces. 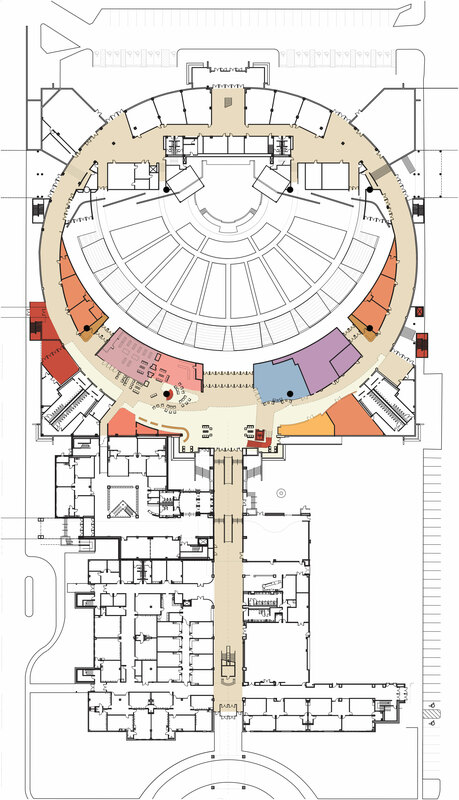 These worship spaces are organized along a concourse awash of natural light.